By Jean AbiNader, Moroccan American Trade and Investment Center (Washington, DC, June 26, 2012) — Some of the governments in the Maghreb are facing a dilemma: how do they balance the demands from their citizens for more jobs, services, transparency, and training, when they don’t have the budgets to address short term needs without mortgaging their futures. They are caught in a bind; on the one hand, economic growth has stagnated due to decreased trade and investment with their major partners in Europe. This leads to contracting markets, decreasing FDI, and fiscal policies directed at cutting costs. On the other hand, governments, energy and non-energy producers alike, are under pressure to generate economic expansion that either stimulates growth through exports or benefits from increased external monies from tourism and remittances. Governments from Mauritania to Libya are struggling to implement policies that both build stronger, more transparent and robust economies, while providing at least some relief to citizens with high expectations for jobs and services. On June 13, The Center for Strategic and International Studies (CSIS) hosted, “Building Stability through Inclusive Economic Growth in the Maghreb,” which brought together experts and a senior US government official to offer their insights on the prospects for development that will benefit the broadest range of stakeholders. This notion of “inclusive economic growth” is the latest buzzword for describing the new social contracts that are emerging, albeit with some difficulty, between government and its people. My takeaways from the presentations are that we have both learned a lot and understand a little, and that is especially true for the new governments struggling to meet rising expectations that are rapidly becoming demands. While, in hindsight, we saw everything coming, the dilemma for those countries experiencing the greatest change, i.e., Tunisia and Libya, is the lack of certain assumptions about how to proceed. The conference focused on “political-economic factors shaping economic growth strategies,” which basically means “what do governments want to do and what tools do they have to make it happen,” and the proposition of greater regional trade and investment as an effective option for growth. While there was agreement on the long term need for jobs, reducing wealth disparity, reforming business regulations and the financial sector, and better integration with the global economy, it is the short-terms fixes that are generating concerns. Mohsin Khan of the Atlantic Council called them a “populist economic model” that promotes government employment programs, food and fuel subsidies, cash transfers, increases in direct taxes, expansionary low interest rates, and other immediate remedies. The obvious consequences of these actions are that governments are increasing their debt in the short and medium term without a clear formula for how to pay for these expenses down the road. The impact is broadly felt across the region’s economies in terms of decreased value of the local currency, higher inflation offset by government subsidies for basic goods, budget deficits, and deferred reforms. Over the longer term, Maghreb countries need to reduce the role of state owned enterprises, build friendlier and more transparent business environment, strengthen robust financial sectors, and figure out how to operationalize “inclusive growth.” Conference participants did not have any magic bullets as to how to balance the short term consequences with long term imperatives. 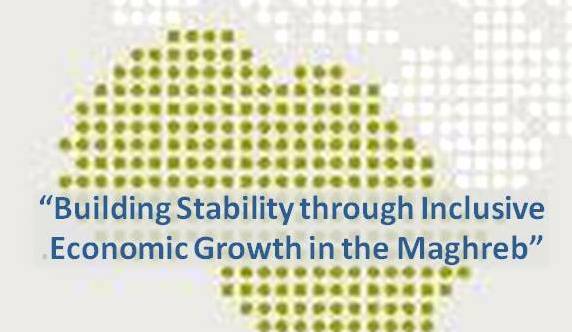 Yet there is a case to be made for greater regional trade and investment as a vehicle for growth. The often-quoted statistics about the low level of intra-regional trade make it obvious that any real growth will be beneficial. The ground-breaking Peterson Institute study in late 2008, the IMF series on the Maghreb private sector, and the latest World Bank study on the growth potential of regional integration, all point to the benefits of greater cooperation. In his remarks, Geoff Porter concluded that more economic integration is inevitable, that businesses across the region are optimistic about cooperating for the future, and that regional political obstacles are fading in importance for the private sector. Given the still transitory nature of most of the Maghrebi governments, Morocco and Mauritania being the only exceptions, another expert source underscored how “much has changed and has not changed,” citing concerns that a populist economic model may impede the needed reforms to spur domestic investment and hopes that subsidies over time would lead to a new, more targeted social safety net strategy for each country. The presentations mirrored the reality on the ground…no startling breakthroughs in how to satisfy citizens weary of politicians’ promises and impatient with policies that seem to benefit only those already in power. Most of the panelists were complimentary to Morocco for its stable transition under a new constitution, but its new government faces the same demands as the others. Conflicting perceptions of what needs to be done and what can be done by governments and the private sector do not make it clear how the benefits of the short term solutions will play out over time. Since, with the advent of the Arab uprisings, it is clear that economic and political reforms are two sides of the same coin, the path forward is neither obvious nor readily accessible for most decision-makers who must craft effective solutions that do more than buy time.